Orlando, Florida:: Rachel Simmons,, 2008.. One-of-a-Kind. 51.5" x 56.5" x 6"open. Accordion structure. Printed digitally on Epson Enhanced Matte and Okawara papers. Materials: acrylic ink, linoleum relief prints, yarn, board. Signed and dated by the artist. Rachel Simmons: "As with much of my work, this artist's book focuses on an aspect of our complex relationship with the natural environment, in this case, with the issue of plastic pollution in the ocean. In 2007, I spent a month at a residency on the big island of Hawaii. One day, another artist at the residency, Pam Longobardi, drove us all down to Green Sand Beach where we were shocked to discover huge piles of plastic waste piled up on an otherwise pristine coastline. 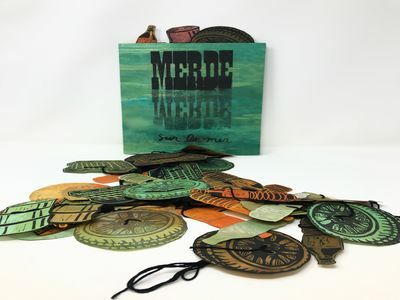 I began to research the Pacific Gyre, a floating area of plastic pollution larger than the state of Texas in the Pacific, and created this artist's book as a result.